aeroSystems comes with two pieces of software. One is called aeroServer and the other is called aeroAvionics. Both are required to run to use the system. If you’re only running one PC there is nothing to setup. Run the aeroServer and aeroAvionics, position the avionics displays and start flying. If you’re running multiple PCs across a network there is more information below. You can use one PC with dual monitors and another PC with a single monitor. It’s up to you how you place the avionics. Is is important to note that if you want to display two sets of PFD/ND avionics then you must have these on the same PC, either on different monitors or the same monitor. Each aeroAvionics software has the PFD/ND/CDU/MCP/EFIS but you need to choose which one is the Captain. You cannot use two CDUs on the system or two separate PFD/NDs. Remember, the First Officer’s display is just a mirror of the Captain’s and he will have no control over the route or display. It is just there as a mirror. aeroSystems has not been designed to be a 2-person system but mirroring of the display allows two people to be present when flying. aeroSystems is easy to set up when using a network if you follow these rules. aeroServer and Flight Sim must always be run on the same PC. Do not run aeroServer on any other PC. aeroAvionics can be run on any PC, including the one running aeroServer. 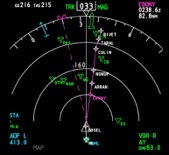 aeroAvionics talks to aeroSever across the network and needs to know its address. Once you know the IP address et up is very simple. 4 - click Network and Sharing Center. 5 - under Connection, click View status. Your computer's IP address appears in the Value column, next to "IPV4 IP Address." On every other PC (not the aeroServer PC) that is running aeroAvionics, right-click to display the menu and select Network Address and enter this number. Set up is now complete and the avionics should come to life. If aeroAvionics cannot connect to the aeroServer check that you don’t have any anti-virus or firewall software running. Also check that you have entered the correct IP number. Any number of monitors can be set up on any number of PCs. It is generally best to keep the Flight Sim and aeroServer PC for displaying the scenery and the other PCs for displaying the avionics. The avionics must be set up in a specific way otherwise the system will not work correctly. 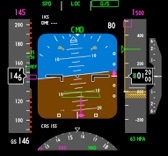 aeroSystems can display a PFD/ND for the Captain and a “mirrored” PFD/ND for the First Officer. However, aeroSystems has been designed for ‘Captain’ use only, that is, as single user. This means that the First Officer has the same display as the Captain but cannot interact with the PFD/ND systems. To use this feature you need multiple monitors as the PFD/ND cannot be mirrored across network machines. On one aeroAvionics PC you MUST run the PFD, ND, MCP and CDU. You cannot split these systems out to separate PCs. This should be the Captain’s PC. If you want another display for the First Officer run another monitor from this PC and in aeroAvionics set up the First Officers PFD/ND display. These are effectively copies of the Captain’s display and aeroAvionics draws them twice in different screen locations. On another PC you can run aeroAvionics EICAS screens, or you can use two PCs for each of the upper and lower EICAS screens. Always plug MCP/EFIS/CDU hardware into the aeroAvionics PC which has the Captain’s PFD/ND/MCP/EFIS/CDU. Run Flight Sim, aeroServer and aeroAvionics on the same PC. Run Flight Sim and aeroServer on one PC and aeroAvionics on the other. Run Flight Sim and aeroServer on one PC and aeroAvionics on the other two. Run Flight Sim, aeroServer and aeroAvionics on the same PC. Position the displays accordingly. Monitors connected to the PC are displayed in amber. In these examples PCs are display in green.